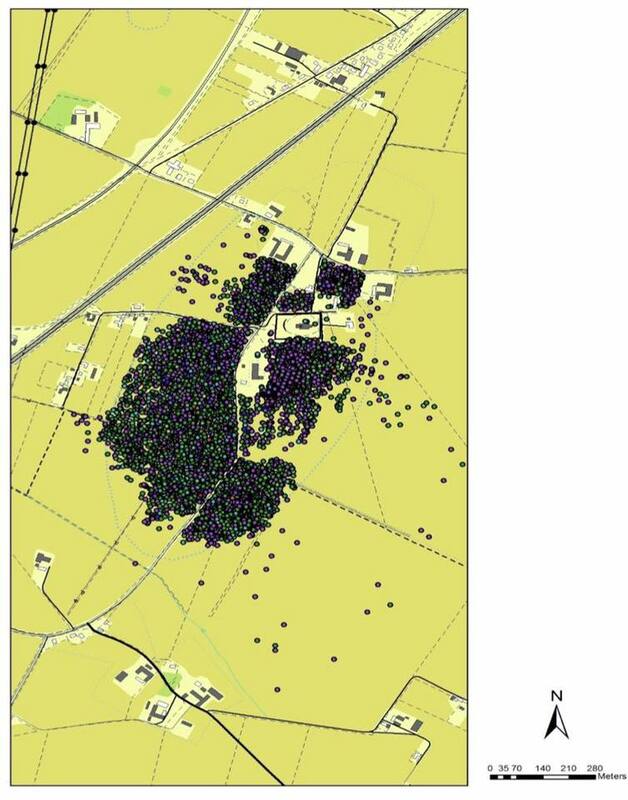 Today it is obvious that Uppåkra is a very special archaeological site. Graves from the Stone Age and Bronze Age indicate that the place was already of significance 4000 year ago. Yet it is Uppåkra’s Iron Age settlement that has received the most attention. The finds help us to understand the people who once lived here. In the earth innumerable remains still wait to be discovered – only a small portion of the the settlement area has so far been excavated. Yet with every new excavation, and with the help of the research carried out, we get an ever clearer picture of this unique place. The mission of The Foundation for Uppåkra Archaeological Centre includes the disseminating the archaeological knowledge derived here to the general public. 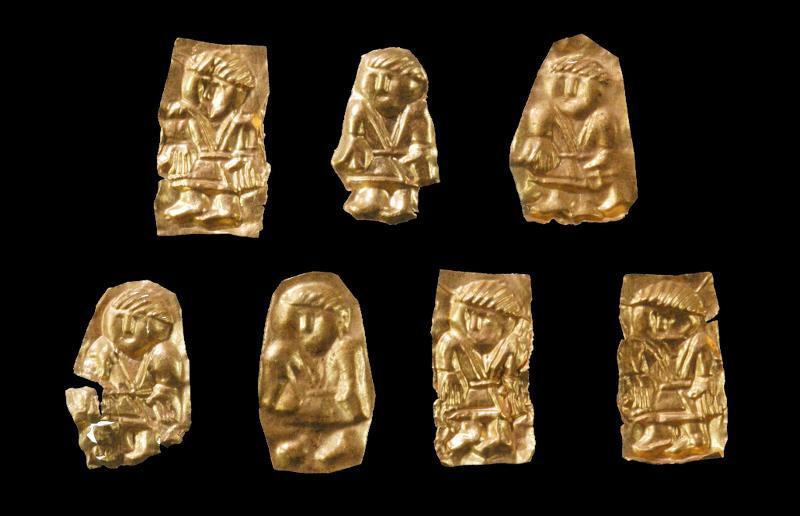 The finds are on display at the Lund University Historical Museum, and 3-D copies of a selection of these finds are available at the Uppåkra site. 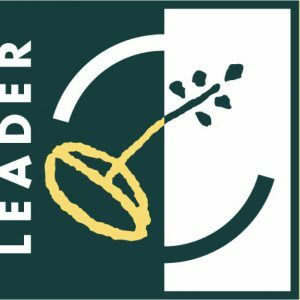 Do you want to see the archeological findings in person? Click here! Detta är en flygbild på de fynd som metalldetekterats. Över 28 000! This is a glass bowl made by using a layering technique. On a bowl of clear glass a layer of blue glass was added, which was then ground away, leaving only the lotus pattern and the border edging. 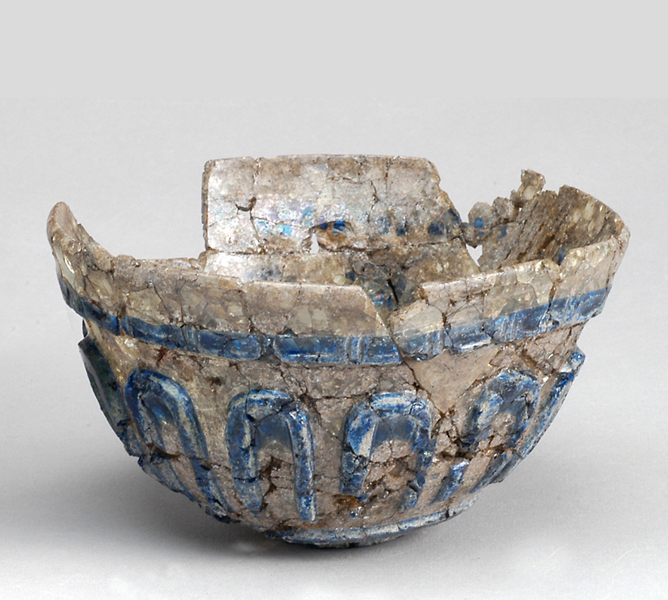 The bowl was found in the ceremonial house, but most likely originates from the region north of the Black Sea. Fibula, eller dräktspänne, tillverkad i så kallad borrestil, c:a 800 e.Kr. Spännet har troligtvis burits av en kvinna. Discovery Channel gjorde ett reportage om spännet, som då blev världsnyhet. Föremålet skulle förmodligen föreställa ett lejon – en tidigkristen symbol för kunglighet och godhet. Men upphovsmakaren hade med sannolikhet inte sett ett lejon tidigare. Många tycker att spännet liknar Musse Pigg. In a burned down house researchers found several medallions made of gold, so-called bracts. 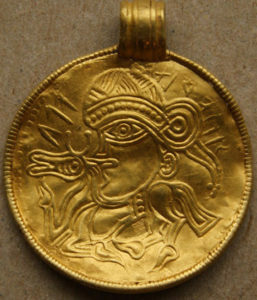 They were popular jewelry during the Migration Period 400-550 AD) and the Vendel Era (550-800 AD). They were probably inspired by Roman coins with the image of the emperor, which many men wore around their necks to signify that they had served Rome in the army. Together with weapons and bones, a number of surgical instruments have been found in the area around the temple. These were used by the doctors of that period. 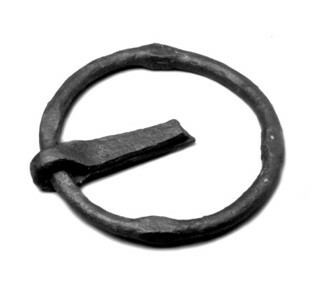 This ring handle of iron was found in one of the postholes if the ceremonial house. Perhaps it sat on one of the three doors, only to be discarded when the house was abandoned in the 10th century. 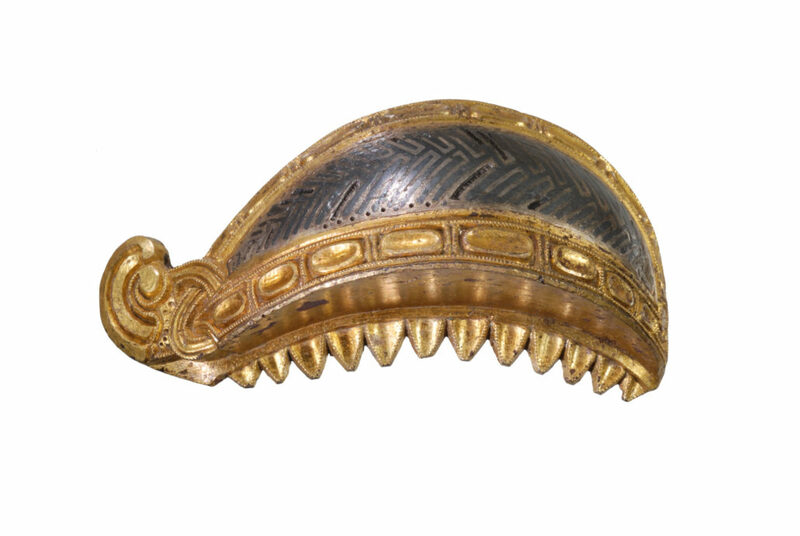 This impressive eyebrow bow of gold plated bronze and silver once decorated a magnificent helmet from the Vendel period (ca 550 to 800 AD). 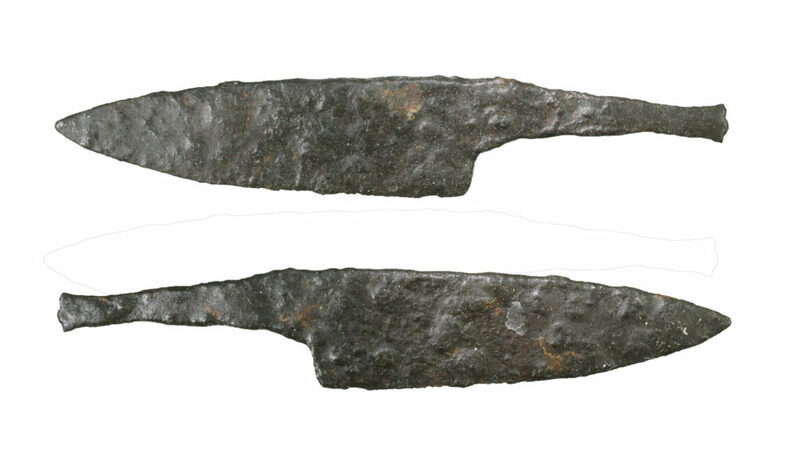 It is possible that two small boars in bronze were also on the same helmet as decorations, since they were found in conjunction with the eyebrow bow. In Uppåkra only a few fragments of helmets have been found, but are examples to ones from Vendel and Valsgärde in Sweden, and Sutton Hoo in England. This piece of bronze work was found just outside the south wall of the hall. Most likely it was part of a larger object. It is possible that the figure represent Völund, the master smith who had magical powers. In the Norse mythic verse collection Eddan from 9th century, Völund is captured, but manages to escape with the help of wings that he made himself. 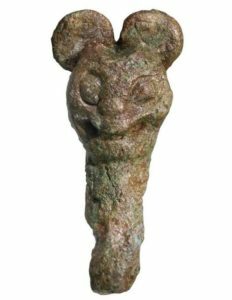 The little statuette was found south of Uppåkra Church, and is among the more unusual finds. The figure may possibly depict a lion fighting two serpents, which relates to Christian symbolism. That is why it is called ‘Helge’ – the Holy. 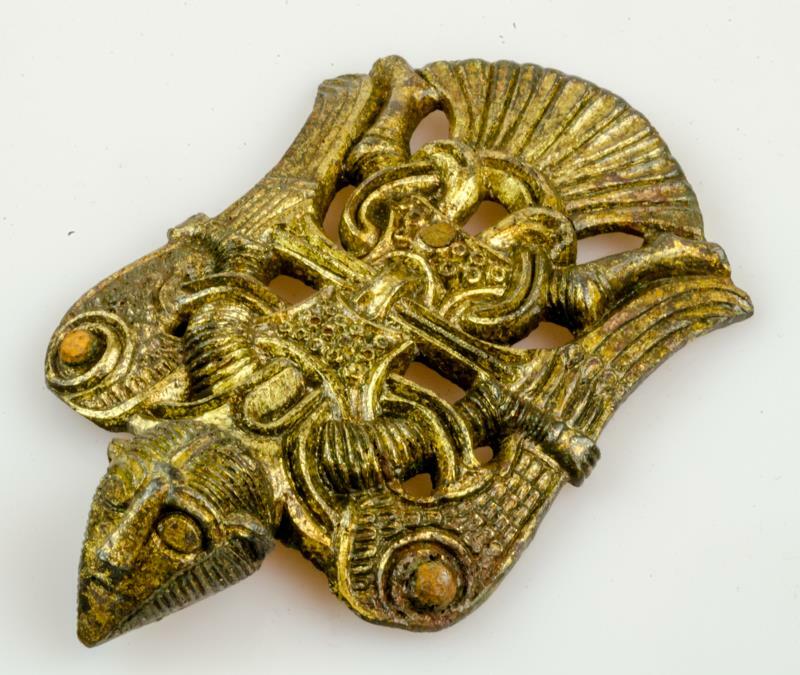 The object is reminiscent of the Frankish-Carolingian style, prevalent in the region of region of present-day France, England and Ireland, which was common around 800 AD. 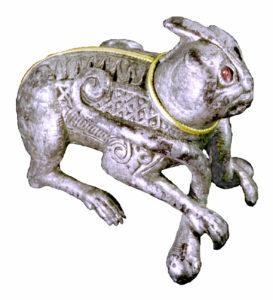 Thus this animal figure could be on of the first Christian artefacts to have reached Uppåkra. 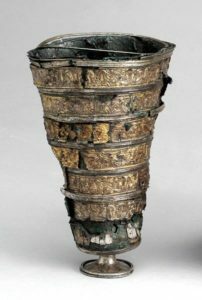 This magnificent chalice is made of silver, with gold bands around it. It was found in the ceremonial house at Uppåkra – probably it played a part in the rituals there before being buried in the earth. Pictures of animals and humans in motion on the gold bands suggest that the chalice dates from about 500 AD. It can have been made at Uppåkra..
A hall structure burned down sometime during the 7th centyury AD. 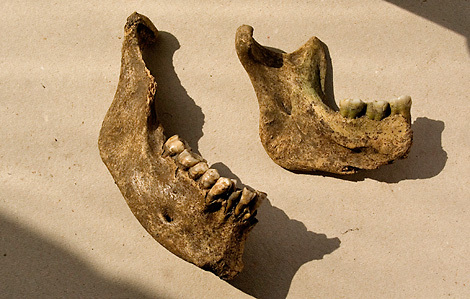 In the charred remnants of the building archaeologists found the remains of many people, including these jaw bones. Probably the hall had been attacked, set ablaze, and the dead were left where they were. 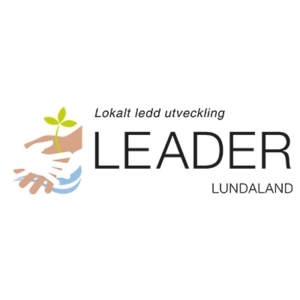 I hålen efter stolparna och längs ceremonihusets väggar har 122 guldbleck, så kallade guldgubbar, hittats. Guldgubbarna är små och tunna som frimärken. De hittas på järnåldersboplatser runt om i Skandinavien. Kanske satt dessa små guldbleck uppe på väggar och pelare, glittrande i skenet från elden.